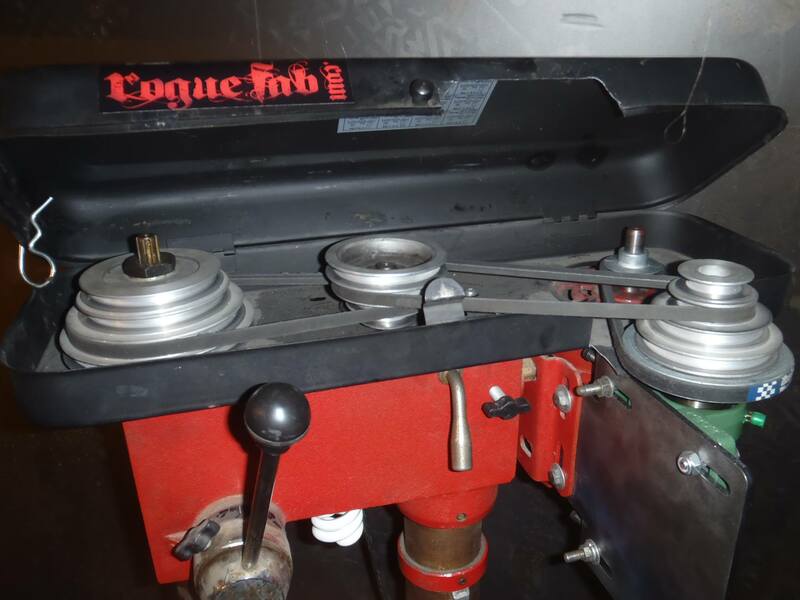 Reduce the RPM of Your Drill Dress With a Drill Press Reduction Kit From Rogue Fabrication! We design and manufacture universal reduction kits for belt driven machine tools like drill presses. These kits can be used on many other machines from band saws to pumps. To figure out your spindle RPM after installing one of our kits, use the calculator below. If you have ever used a drill press to drill holes in metal larger than about 1/4 inch with a drill press, you probably noticed that the bit cuts small chips and didn’t stay sharp for very long. This is the typical symptom of drilling with too high of RPM. Most drill presses bottom out at 250-600 RPM. This is just too fast for metalwork. With of our kits, you can cut that speed by 50%, 75%, or even 94%! This is a cheap imported drill press using a Rogue Fabrication Drill Press Reduction Kit to slow down the spindle speed. This kit is only a 2:1 reduction, but Rogue Fabrication sells kits that go as low as 4:1. We are using the low speed to allow the press to cut large holes in metal (1″ and larger) and also for tapping operations, as shown here. Will It Work on My Drill Press? A motor shaft that is 5/8″ – OR – Belts the same size of the kit you are ordering. If you want to slow down a drill press that doesn’t meet either of the criteria above, give us a call and we will make a custom solution for your machine. We stock many shaft, pulley, and belt sizes. We also make custom kits for high end variable speed drill presses. See the bottom of this page for examples of “will it work on my drill press?” answers. 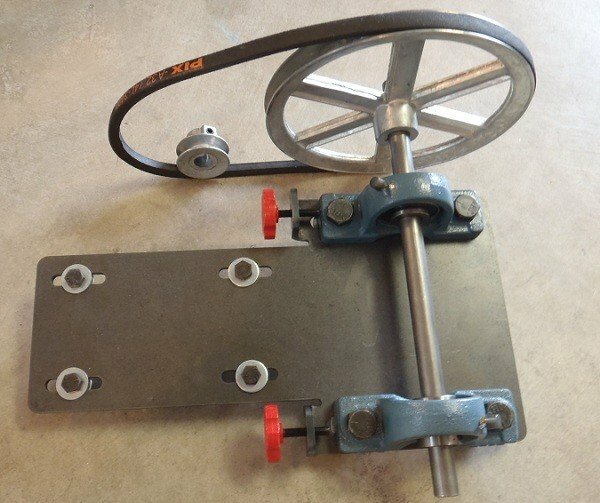 What drill press should I buy? If you do not yet own a drill press, this may help you pick one out. For metalwork, you want to start with something that has good low RPM power capacity to start with. Don’t consider anything under 1/2 HP or smaller than a 1/2 inch chuck. NEMA 56 motors are the most common to find replacements for. Just make sure the motor mounting is close to 3×5 inches and has a 5/8 shaft and if you want to be sure you have a NEMA 56 Motor. Floor or benchtop is preference unless you plan to have LARGE work pieces in the press. Units with 3 pulleys gives you way more speed options than the 2 pulley models. 5/8 chuck and 3/4 to 1 HP is the biggest you will likely need. Larger will waste power and not hold small bits well. Typically 1/2 HP and 1/2 inch chuck is sufficient. Two common nominal motor speeds are out there, 1800 and 3600 RPM. You should start with the much more common 1800 RPM, the motor will read 1725 RPM. These are obviously slower and better for metalwork. Common minimum RPMs are 200-600. Avoid any machine with a system called “vari-belt”, “vari-speed”, etc. These have variable pitch pulleys and are not fun to modify, and generally have a terrible range of speed adjustment. Taiwan models can be just fine. Keep in mind these are sometimes over-rated on motor HP. 1960-1990 is probably when they were the best. $50-200 USED, or Around $200-400 new. Old American made machines are GREAT, although they can be hard to find. Pre 1980 Black and Decker, pre 1970 delta or rockwell (they import now), among others. Check for the manufacture location, almost all of these brands import some of their line. $200-1000 USED. $1000+ new. Here is an image of our 2:1 reduction kit on an inexpensive 3/4HP tabletop drill press. It now drills at 125 RPM! This CAD image shows our 16:1 kit, and the belt routing detail. The 8:1 kit looks the same, just with one of the large 8″ pulleys replaced with a 4″. Belt guard not shown for clarity. 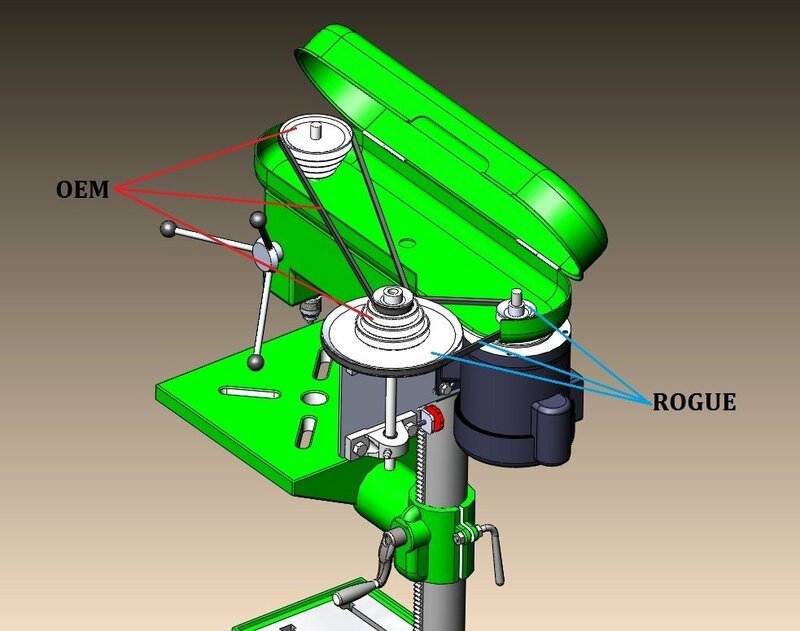 This CAD image details which parts come in the kit and what you use on your existing drill press. You may also notice that this press doesn’t have an idler pulley. Here is an image of a 4:1 kit assembled but not installed on a drill press. Q:My drill press is a Central Machinery model 38142. I measured my motor shaft and it is 5/8″, and but the belts are only 3/8″, and I want to use the 1:4 kit and it only comes with 1/2″ belts. Will it Fit? A:Yes it will. Your drill press meets one of the 2 requirements, and it only needs to meet one. Since you have a 5/8″ shaft, you will be able to arrange the pulleys so that the 1/2″ belts go to 1/2″ pulleys and the 3/8″ belts go to 3/8″ pulleys. No problem! Q:My drill press is huge JET JDP20MF 20 inch drill press. The motor shaft is 3/4″, and the belts are all 1/2″, and I want to use the 1:4 kit, but I see the pulleys are 5/8″ in your kits. Will it Fit? A:Yes it will. Your drill press meets one of the 2 requirements, and it only needs to meet one. Since you have a 1/2″ belts, you will be able to put both of the reduction kit pulleys on the reduction kit shaft, and leave your original pulleys where they are. You will route the belts the same way as our pictures (except with the cone pulley still on the motor, and the small pulley we supply above the large pulley on the reduction shaft). You will get the same overall reduction! Q:My drill press is very small Delta drill press with a 1/4 HP motor. The motor shaft is 3/8″, and the belts are all 1/4″, and I want to use the 1:4 kit. Will it Fit? A:No. Your drill press fails both of the requirements above, and it needs to meet one or more. Also, your motor is outside the range that we support. We have multiple bolt patterns on our reduction plate, but we do not have the patterns for motors smaller than 1/2HP. Q:My drill press only has 2 pulleys, one on the motor and one on the spindle. All your photos show 3 pulley drill presses. Will it still work? A:Yes, and long as you meet one of the 2 requirements (5/8 shaft or kit with belts that match your drill). It doesn’t matter how many pulleys your drill press has, our kits will add one or two pulleys and still have the right belt tension adjustment. We have several photos of customer’s drill presses in the reviews section, and some are only 2 pulley tools. Q: My drill press does not look like your photos. 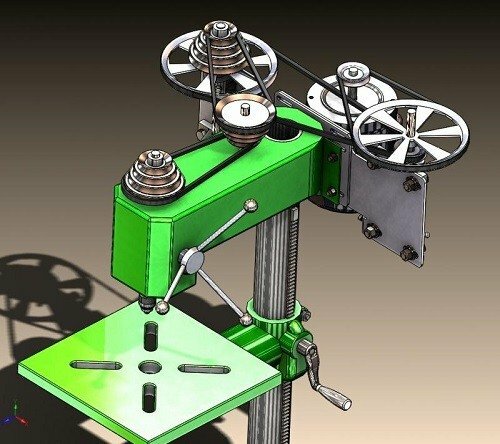 It has two spring loaded pulleys and a crank that changes the speed on the front, not cone pulleys. Will your kit work? A: Yes, you have what we call a VS drill press (VS = Variable Speed). You will have to order one of our VS kits and get us a few measurements for custom machining.